As tempting as it is for me to opine about the car bomb that luckily failed to detonate in the heart of Times Square’s theater district on Saturday – thanks to the T-shirt vendor of the year seeing something and saying something – and as much as I wonder if this impotent explosive device was planted by a home grown lunatic or was it courtesy of the rifle-toting bearded guys in ankle length shirts that hate our guts and sleep together in caves, well, I’m not going to participate in that discussion here in Lame Adventures, a forum devoted to the silly in the mundane. I would like to discuss the literally rotten apple that crossed my path on Sunday here in the Big Apple. After doing my usual daily grocery shopping, I return home and as I am putting my purchases away, I notice that one of my Macoun apples is moist. 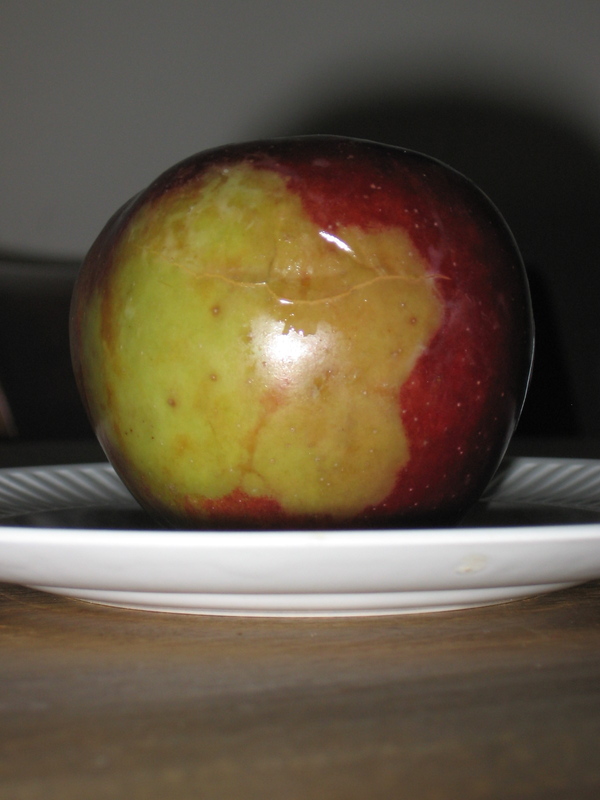 As it turns out, the apple is perfect on one side – the side that drew me like metal to magnet, and rotting mush on the other. I debate what to do, take the time to return it, or just be philosophical about it. Hey, sometimes it’s just your turn to purchase The Rotten Apple. Then, I take some photographs. The Wicked Witch of the West side. After the photo shoot with The Rotten Apple, I decide, “What’s the worse that can happen if I try to return it? Do I look like an apple thief? 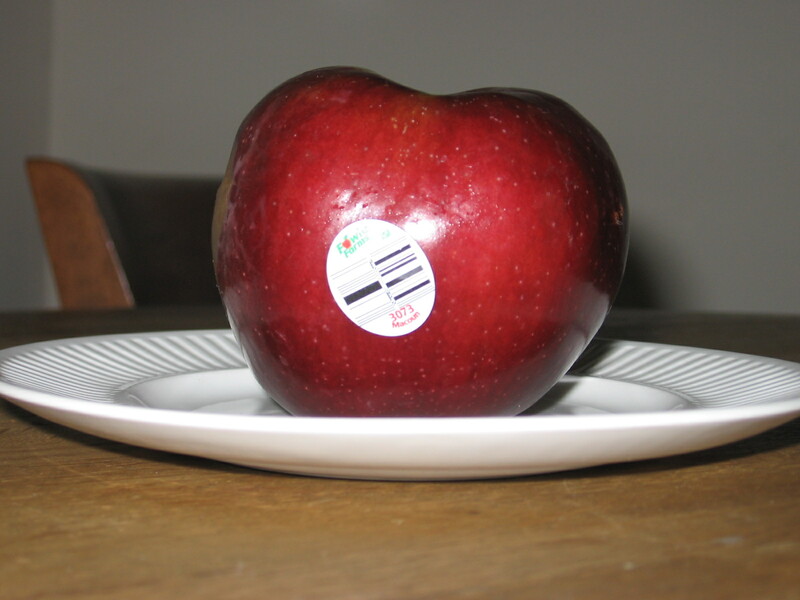 I’m small, pale, bespectacled, and equipped with a store receipt declaring I purchased The Rotten Apple minutes earlier.” There’s always a window of time when a purchase goes awry. For example, last year Milton and I had a Broadway theater ticket snafu. Broadway’s iron-clad no returns no exchanges policy does have a few hours of wriggle room if you happen to buy your tickets at the theater box office and the ticket seller you purchased your wrong tickets from is still working at that window. Milton and I encountered this exact situation when we got the wrong seats to Neil LaBute’s Reasons to be Pretty. Fortunately, the ticket seller remembered us. She probably thought, “Those two nerds.” Actually, she was quite considerate. I recall that she even blamed herself for my inability to correctly read our seat numbers, and was kind enough to take back the tickets in exchange for the seats we wanted in the first place. I am not suggesting that anyone reading this post purposely screw up a theater ticket purchase to try out this brief window of time theory, but in legitimate cases where you come across as desperate, subservient, and so repentant you appear ready to journey to Lourdes, Broadway ticket sellers do have the capacity to take pity on theater loving fools. Back to the situation with The Rotten Apple, I venture up the street to my market carrying The Rotten Apple in a bag, and enter through the out door since it’s closest to where the store manager hovers. Just as I am about to approach him, Shavone, one of my favorite cashiers, calls out to me. Since her station is uncharacteristically empty, I approach. Me (holding up my bag for emphasis): Yeah, I bought a rotten apple by mistake. Shavone: You have to go upstairs to Customer Service on the second floor to make a return. They won’t give you a refund down here. Me: I don’t want my money back. I want another apple. Do you think I can get another apple and make an exchange? Shavone: Probably. Go upstairs and talk to them about it. Before going upstairs, I grab another comparably sized apple, make sure this one shows no signs of rot, and hightail up to the second floor. There, I encounter the Customer Service worker who reminds me of myself at work, someone bored beyond belief. Me: I bought a rotten apple by mistake this morning. I’d like to exchange it for this one. I show her both The Rotten Apple and the un-rotten apple of my dreams. Customer Service: You have a receipt? I hand the Customer Service worker my receipt. She glances at it, hands it back to me, and then takes my rotten apple. I then hightail downstairs equipped with my un-rotten apple, make a bee-line for Shavone’s register and purchase a six-pack of bottled water. The woman in front of me in line is making the same purchase. She notices. Woman in Front of Me: Looks like everyone’s buying water today. Shavone: It is hot out here. Me (resenting being equated with everyone thinking): Thank you. Shavone completes the transaction with the Woman in Front of Me, the leader in bottle water purchasers. It’s now my turn. Shavone: They take care of you upstairs? Me: Yeah, I got a new apple. Shavone's trademark nails -- all real -- and she can work a register like a magician with them! This entry was posted in Humor and tagged apple, bottled water, Broadway, shavone, times square. Bookmark the permalink. 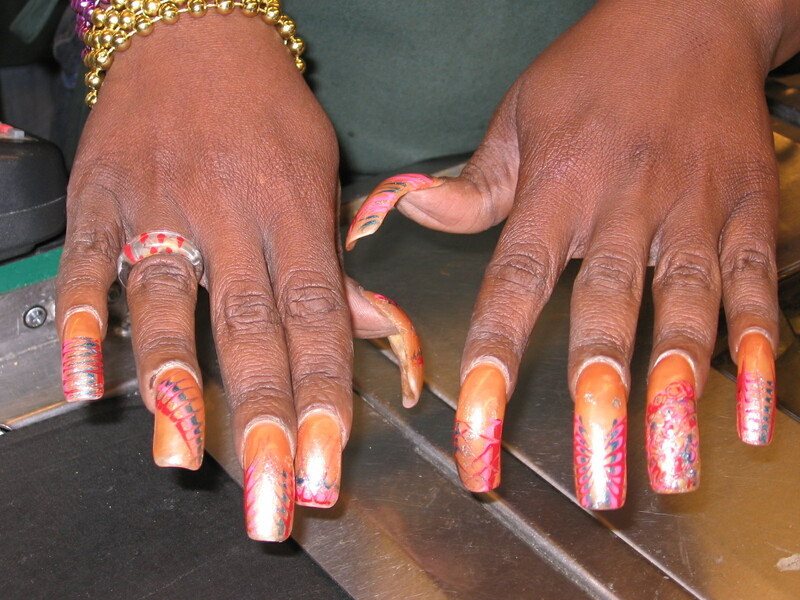 If I had those nails I would cut myself wiping after I pee and I would have a scabbed over face.